It is said that a three-year-old has a vivid imagination, is full of joy, moves fast, babbles a lot and makes questions out of curiosity. Well, in my opinion this describes perfectly the three-year-old Weecos as well – Happy Birthday! Like a child, Weecos has taken giant steps of development between the ages of two and three! There have been both huge physical and mental changes. First of all, Anna Kurkela, the co-founder of Weecos, spotted the perfect new place for an office where all her companies could be under the same roof. 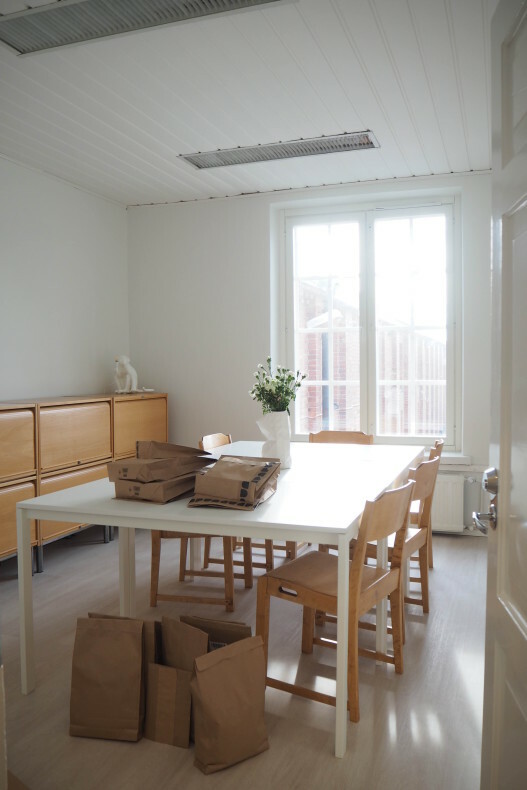 A renovation with the help of a local company, Nokian Väliasema, and the cosy office from Kauppakatu moved to Nokian valtatie, next to the Nokia railway station. For the workers this has been an extremely good change. Instead of different working stations, we actually have this small community of co-workers and can have a lunch break together. It’s wonderful! And not only we have this cosy workplace but also a great team has taken its form. 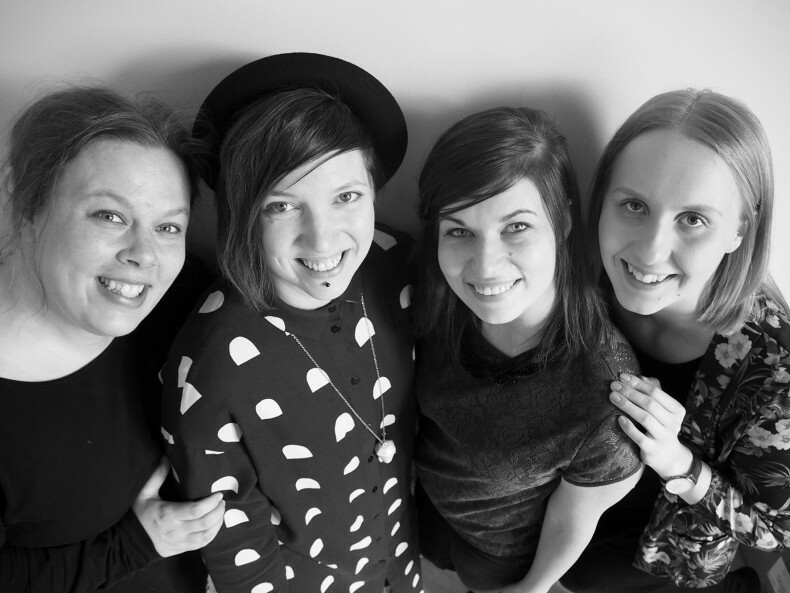 The Weecos team: Hanna Lusila, Anna Kurkela, Anu Hurme and Lotta Heinämäki. In addition, we have had the pleasure to work with amazing people! And this is actually the second big change. During this year, we have learned that only imagination is the limit and asking is the only way to go forward. Let me open up this idea a bit. By asking and by being curious we have met a lot of fascinating people with unbelievable talent and knowledge. For example, meeting Heidi Korva at our pre-Christmas party lead to co-operation with Fashion Revolution and the FIN POP-UP at Sokos Helsinki, which from we all are extremely proud of! The pre-Christmas party in November 2015 was an amazing get-together with all the entrepreneurs of Weecos. Like said earlier, it is important to regularly see and talk face-to-face with all the entrepreneurs and maintain a close relationship with them. At the new office. 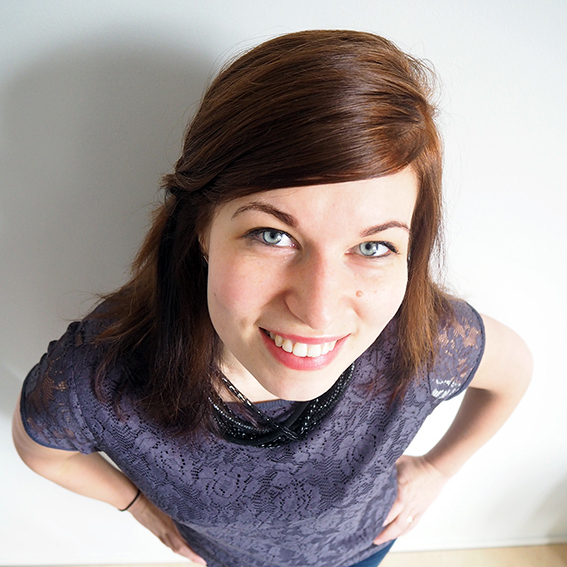 Photo by Hanna-Riikka Heikkilä. This feeling of creating a community is great and it as been the goal of Weecos since day one! In the field of responsible business, co-operation and sharing knowledge are key elements. The best thing is to see that people are working together and that people realize that co-operation benefits us all. All though it sounds a bit cliché, there’s a lot we can learn from each other. We now know that people are interested in Weecos, in responsible business. At the new office. 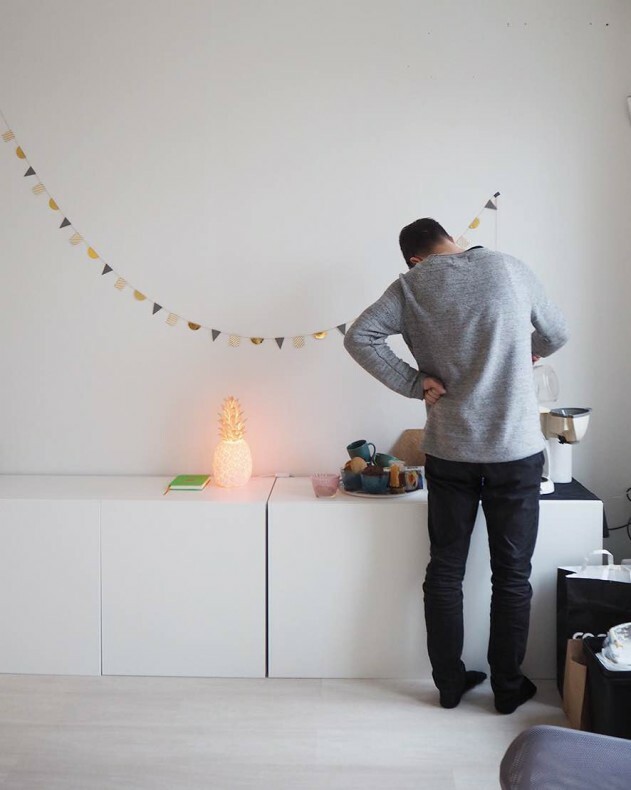 Jussi Kurkela, the CEO of Papu Design, making coffee. Photo by Hanna-Riikka Heikkilä. Well thirdly, due to the rich imagination of our team and this new self-confidence in making initiatives, Weecos is as part of Neulomo. Neulomo aims to keep the Finnish textile industry in Nokia, improve it and develop it further. 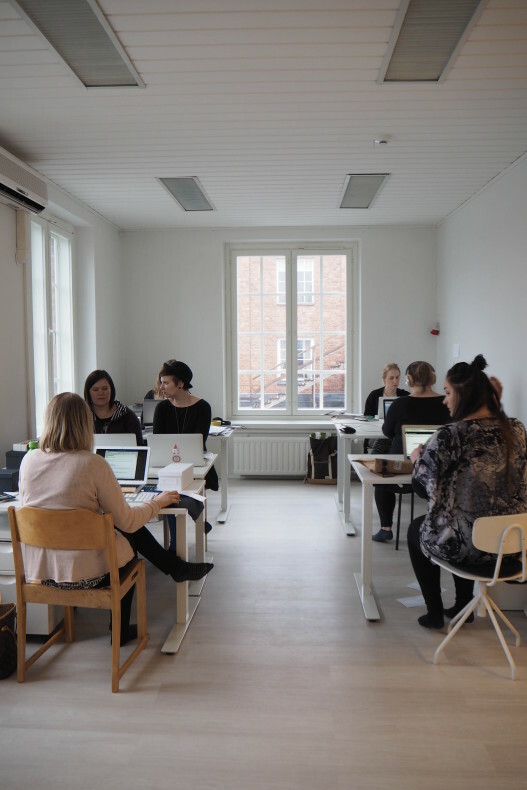 One of the reasons Weecos wanted to be part of this is that we see how the companies would like to maintain production in Finland and use domestic work. At the same time the entrepreneurs at Weecos are struggling with the fact that textile industry is fading in Finland. We have incredible designers in Finland, why not the textile industry also. Great partners to this huge idea have been found, and so far it has been a rewarding journey. Let’s keep our fingers crossed that we are able to continue. Due to a lot of effort amazing achievements have happened this spring, or what do you think? This year gives us self-confidence to continue the development of Weecos and the digital sustainable ecosystem forward. And what about next year? Well, it looks at least as interesting as this year has been! Firstly, Anna is travelling around the world with her family for a year. That is something you can follow here. And secondly, Weecos starts a crow funding campaign in autumn. Exiting times for a fast moving, curious and chattering toddler, right? Oh, almost forgot! One thing hasn’t changed though – the joyful way of doing things. A quote from CEO Hanna Lusila is justified here: Never take things or yourself too seriously!